Hi everyone, we’re Clarissa and Diana from the blog Dogdays of Summer and we are glad to be guest posting on Interiors by Jacquin today. 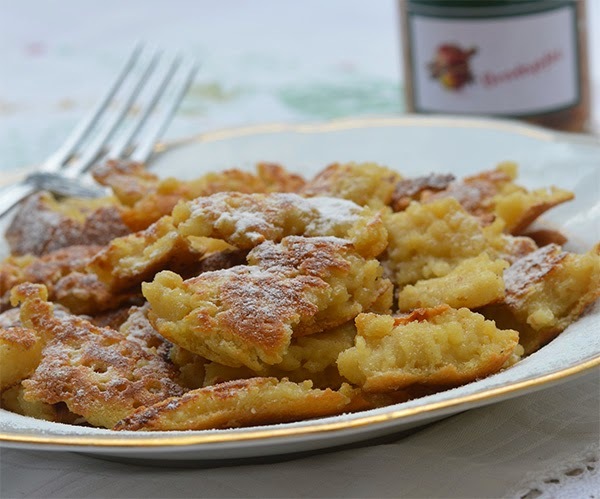 We’re excited to show you a very traditional food from our country, Austria – in a very nontraditional way: Vegan Kaiserschmarrn. All keeping with Interiors by Jacquin’s fun global recipe theme! Austria is famous for its good and solid cuisine, so being vegan and “eating more clean” were not the most common things back in the time of emperors (=”Kaiser”). But now more and more people have changed their minds and are trying a more healthy lifestyle and alternative way of eating. So we thought it would be nice to join in this changing traditional while featuring a traditional Austrian sweet with a vegan twist. Here is how to make this delicious dessert! 1. Mix soy milk and soy flour. Add baking soda, agave nectar, flour and raisins and stir until smooth. 2. Put the oil into a pan and let it heat. Then put the batter into the pan and bake it like pancakes (so first side one, then side two). 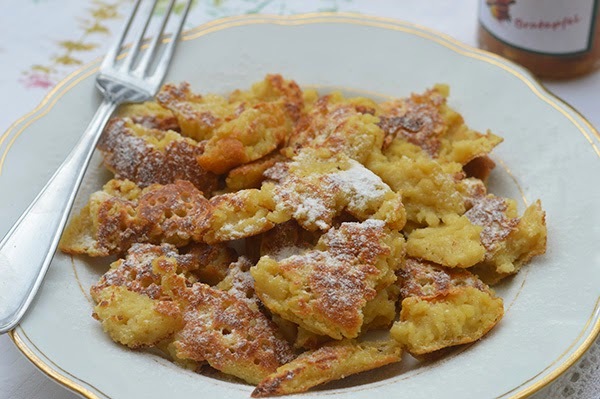 While baking the flip side, cut the Kaiserschmarrn into pieces (normally this works with a fork, but you could also take a knife). 3. We either eat our Kaiserschmarrn with a certain plum mouse or with apple sauce. For this sauce, peel the apples, cut them into pieces and cook them at low heat (add a little bit water, if it needs more). 4. When finished with cooking, blend the apples and add cinnamon and powdered sugar to taste. 5. Serve the finished Kaiserschmarrn with confectioners’ sugar and your apple sauce. Enjoy! So, for all who are hungry: Take your pan and give this recipe a try! You will love it for sure!